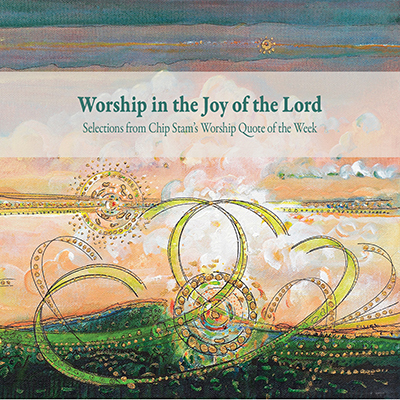 Worship in the Joy of the Lord: Selections from Chip Stam’s Worship Quote of the Week is a curated collection of over 300 quotations on the deep meaning and purpose of Christian public worship designed to inspire, challenge, and equip worshipers and worship leaders to be transformed by the renewing gospel of Jesus Christ. Edited by Calvin Institute for Christian Worship and John D. Witvliet. Purchase a copy online from Amazon. Chip Stam was a gift to the church. This anthology is a deep treasure chest full of Chip’s carefully assembled refl ections. It is an invaluable volume for anyone who treasures Christian worship. This collection of worship quotes displays Chip’s unceasing desire to worship the Savior, proclaim the gospel that changed him, and encourage that passion in others. From Aristotle to Wesley, and everybody in between and before and aft er, Chip Stam has done us the irreplaceable service of gathering worship quotes so that we can drink from the wisdom of the ages and ponder the saints’ insights. These extracts are gems that I will treasure and continue to apply to the Church and her worship. I love this book! Chip Stam was not only a source of much personal wisdom about worship that glorifies God, but he also had the gift of pointing us to other sources of wisdom. We miss him, but the gift lives on in his wonderful collection of gems about bringing more joy into our worshiping lives! What a rich resource of God-centered, biblically sound and theologically profound reflections! Our brother Chip has provided us a feast of gleanings from a wonderful variety of different authors and sources. A fountain of devotional resources for every worshiper (and, with the index, an invaluable sourcebook for the desk of the pastor or worship leader), this collection bubbles with life and wisdom and love for Christ—as did Chip himself. Drink deeply from this well and be refreshed! Chip Stam was a frequent speaker at Symposium, attending regularly even when not presenting. He came out of his warm-hearted love and passionfor the worship and music of the church, which developed into a close relationship with the Calvin Institute of Christian Worship. 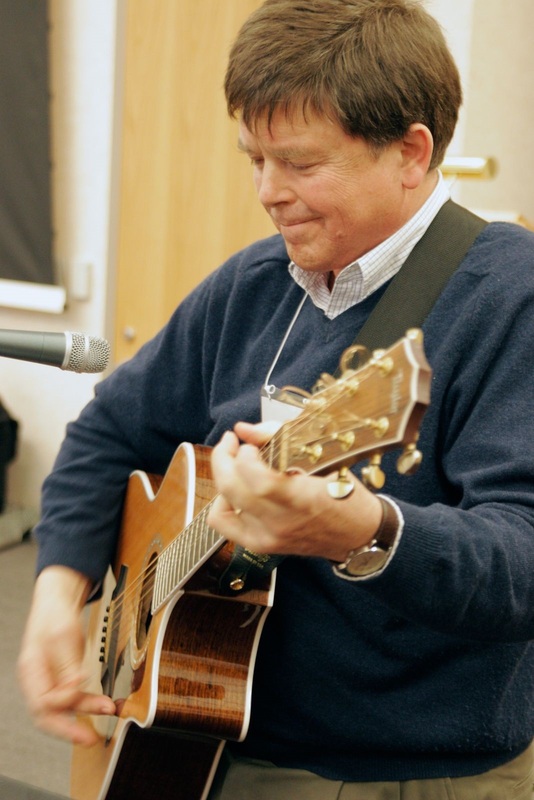 Chip had been director of choral music at Notre Dame University and pastor of worship and music at Chapel Hill Bible Church before moving to Southern Baptist Theological Seminary in 2000, where he became the founding director of their Institute for Christian Worship. One of Chip’s best loved legacies was his “Worship Quote of the Week,” an on-line devotional (that ran from 1995-2011) that mined the wisdom of church leaders throughout Christian history in ways to challenge Christians today. His contagious joy was present even when wearing a back brace the last time he was able to be present at Symposium, during his four-year battle with non-Hodgkin’s Lymphoma. View other Publications or Resources by John Witvliet. Jesus is the King of Kings, yet He arrived as a humble servant. Humility is not thinking you are less, it is never forgetting the fact that it is Jesus who made you more. So, how do you become like Jesus? How do you develop a spirit of humility? Humility is the byproduct of being with Jesus. Anyone who walks intimately with Him will not think more highly of himself than he should. To be loved by Jesus and invited into a relationship with Him, is all we need to right-size ourselves and to assume His gentleness and grace. To be humble doesn’t mean you have to be weak. God has given you all you need to live confidently as His. The proud will never truly lift up God’s name in praise. Yet He raises the humble to new heights. God has no equal. No rivals. No shortages. No needs. He is before all things and at the end of the day He will be the last one standing. The world is filled with “little g” gods, but our God made the heavens and the earth. No one compares to Him. No one even comes close. So as you wait on Him today, give Him praise. Maybe your circumstances appear to be upside down, but His throne is decidedly right-side up! Praise Him in the waiting. Exalt Him in the wondering. So don’t ask for much today, just keep lifting up the Name above every name. Let that Name ground your heart and still your soul. Let your praise drown out all others who contend for your allegiance and affection. When you do, your very song will lift your thoughts to the very highest place. All the earth together declares . . .
Father, what shall I say to You? You have no equal or rival. My words and my thoughts are so small when compared to You. I have seen the starry night and it cannot hold a candle to Your glory. Expand my faith and give me words as I seek to join the anthem of Your praise. All praise is Yours, now and forever. I will walk in that truth today. I will believe it. And act like it. And pray like it. And give like it. And praise like there is none like You. Amen! In the midst of the fray and fury, keep your eyes on Jesus. He is fighting for you. Emmanuel is near. Though accusations fly and the enemy assaults your thoughts, though people try to cut you down and drag your name through the mud, though schemes are launched and temptations roar, though your flesh fails and screams for revenge—your hope is in the One who fights for you. You are safe in God’s love and in the power of His mighty name. Then, weary ones, don’t fear. Am with thee all the way. I all thy dangers see. To give to thee a crown. Father, in the middle of the storm I am setting my hope on You. You fight for me and You are greater than all my enemies. Nothing I face today is more powerful than You. You are the solid ground beneath my feet. Thank You for surrounding those who surround me. Give me peace in the presence of my enemies, knowing that You see me and defend me in Your love. Amen.